I just finished my first mystery socks! 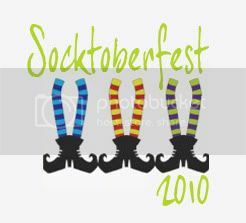 I am in a group on Ravelry called Sock Knitters Anonymous, and the May 2010 mystery/challenge was this pattern. The pattern was given to us in weekly "clues", so we only had a part of the sock each week. The yarn is Dream in Color Smooshy in the color Ruby River. It is lovely to knit and gets even softer once washed. 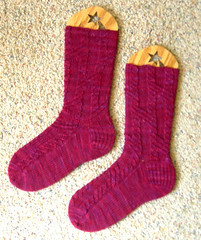 The designer is Cookie A., well known for her beautiful, complex sock patterns.